A second pair of socks have come off the sticks. 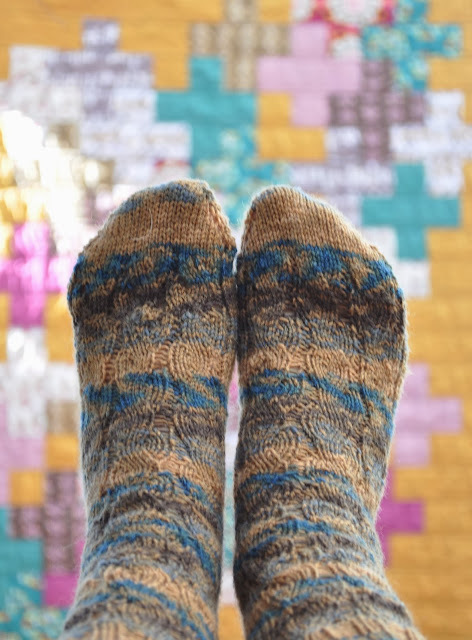 This pair is the Serpentine sock pattern from the book Socks from the Toe Up by Wendy D. Johnson. I knit them two at a time on one long circular needle. A little confusing at first but once I figured out how to keep the balls of yarn separate it was easy. This is my first lace sock pattern which was very easy to follow. I had my share of ripping and repeating, but eventually understood the increases, yarn overs and decreased stitches. I wish I would have made them about an inch longer on the ankle, but I was afraid I might run out of yarn. I also finished the Cascade quilt but will be writing a special blog post all about it, soon. It sure does make a pretty backdrop for the sock photos. I used a Russian bind off technique and I don't think I am very good at it yet. The bind off caused a little bit of ruffling at the top of the socks, but I am sure I will get better as I make more socks. Now I just need some cool fall temperatures so I can wear them. The slight ruffling at the top looks pretty though. You are welcome to some of our very cool Spring weather- I need my socks on tonight! Yours are great- I really admire your skilful knitting! Well done - we can call you the crazy sock lady now!! Your socks turns out beautiful. I am finishing off my first handknitted sock and am really looking forward to knit another right afte it got off the stick! These look fab, I wish i could knit socks, they seem such a lovely thing to have hand knitted, especially as the temperature has dropped so much here! Your socks are lovely, and they are flying off your needles. It is plenty cool enough here to wear them. You're right, they look fabulous with the quilt as a backdrop! I keep giving my sister hints to make me a pair of socks - so far, nothing doing. Looking forward to the quilt post! I absolutely KNEW you would be hooked!!! You lost me at the 'two at a time on one circular needle'. Knitting confuses me. I've been admiring your sock knitting photos for some time but I've just realized that I've probably never told you that. And actually the ruffling at the top looks lovely - I thought it was intentional.